Polyurethane Coated Cut Resistant Gloves Are Used For Applications Including Industrial, Manufacturing, Food Service, And More. Polyurethane coated cut resistant gloves are made of high quality materials for long lasting durability and dependability. 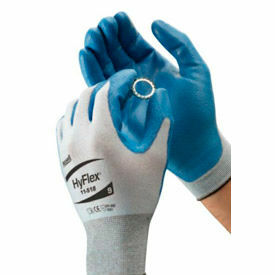 Gloves provide material handling safety where cut level properties are required. Units provide cut resistance, improve dexterity, and increase handling stability. Machine washable for maximum longevity. Cut levels are 2, 3, and 4. Sizes are 2XS, XS, S, M, L, XL, and 2XL. Package quantities are 1 and 12 Pairs. Colors are Black/Gray, Blue, Gray, Light Gray, Gray/Salt-N-Pepper, Hi-Vis Lime, Orange/Black, White, and more. Dimensions vary per model. Uncoated Kevlar® And Dyneema® Gloves Are Used For Applications Including Industrial, Manufacturing, Food Industry, And More. Uncoated Kevlar® and Dyneema® gloves are made of high quality materials for long lasting durability and dependability. Flame and wear-resistant gloves ensure optimal cut protection and manual dexterity. Gloves accommodate metal, ceramic, glass, and other sharp material. Reversible design extends unit longevity and allows ambidextrous use for cost effectiveness. Optional PVC dots improve handling grip when required. Washable styles available. Available styles include Cut Resistant Knit Gloves, Dyneema® & Steel Blend Slabbers Gloves, Dyneema® Seamless Knit Gloves, Full Finger Kevlar® Gloves, GoldKnit® Heavy Weight Gloves, Half Finger Kevlar® Gloves, Heavy Weight Dyneema® Gloves, Heavy Weight Kevlar® Gloves, and more. Cut levels are 2, 3, and 4. Sizes range from XS to 2XL. Package quantities are 1 and 12 Pairs. Colors are Blue/Gray, Gray, White, and Yellow. Dimensions vary per model. 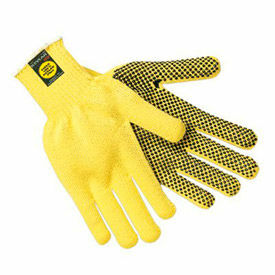 PVC Dots Coated Cut Resistant Gloves Are Designed For Light Weight, Medium Weight And Heavy Weight Applications. PVC Dots Coated Cut Resistant Gloves are made with flame and wear-resistant DuPont™ Kevlar® and other high quality materials for maximum cut protection and long lasting durability. Variety of styles and popular brands available to provide extreme cut resistance and manual dexterity. Available in a variety of types to meet hand protection requirements. Cut levels are 3 and 4. Sizes are S, M, L, XL, 2XL, Ladies and Men's. Colors are Yellow/Brown, Yellow/Blue and White/Red. Quantities vary per type. Nitrile Coated Cut Resistant Gloves Offers Cut Resistance For A Variety Of Applications. Nitrile Coated Cut Resistant Gloves are made with DuPont™ Kevlar® and other high quality materials for maximum cut protection and long lasting durability. Variety of styles and popular brands available to provide lightweight, medium weight or heavy weight hand protection. Available in a variety of types to meet hand protection requirements. 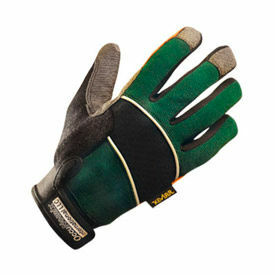 Leather Coated Cut Resistant Gloves Offer Cut Resistance For Wet And Dry Applications. Leather Coated Cut Resistant Gloves are made with goatskin, Kevlar, leather, nylon and other high quality materials for maximum cut protection and long lasting durability. Variety of styles and popular brands available to provide lightweight, medium weight or heavy weight hand protection. Available in a variety of types to meet hand protection requirements. Cut levels are 2, 3 and 4. Sizes are S, M, L, XL, 2XL, 3XL, Jumbo, Ladies and Men's. Colors are Black, Green/Black, Tan and Yellow/Gray. Quantities vary per type. 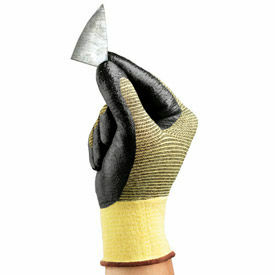 Latex Coated Cut Resistant Gloves Provide Exceptional Cut, Slash And Heat Resistance. Latex Coated Cut Resistant Gloves are made with natural rubber latex coatings and other high quality materials for maximum cut protection and long lasting durability. Variety of styles and popular brands available to provide lightweight, medium weight or heavy weight hand protection. 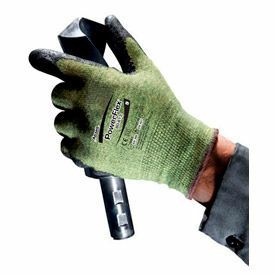 Used for material handling, automotive, construction and other jobs requiring hand safety. Available in a variety of types to meet hand protection requirements. Cut levels are 2, 3, 4 and 5. Sizes are S, M, L, XL and 2XL. Colors are Black/Yellow, Blue/White, Gray/Black, Green/Black, Hi-Vis Lime and Yellow/Blue. Quantities vary per type. 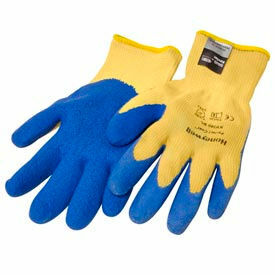 Rubber Coated Cut Resistant Gloves Provide Excellent Grip In Wet Work Environments. Neoprene Coated Cut Resistant Gloves Are Used For Applications Including Automotive, Maintenance, Manufacturing, And More. 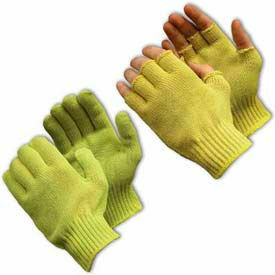 Neoprene coated cut resistant gloves are made of high quality materials for long lasting durability and dependability. 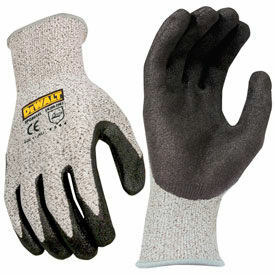 Gloves provide flame resistance and cut protection for welding, cutting, tool handling, and more. Foam coating reduces slippage and hand tension for both wet and dry environments. Ergonomic design ensures dexterity and flexibility for optimal comfort. Washable for reuse. Styles include Cut Protection Gloves/Flame Resistant/ANSI Cut Level 4 and PowerFlex® Cut Resistant Gloves. Cut level is 4. Sizes are S, M, L, XL, and 2XL. Package quantity is 1 Pair. Colors are Green and Green/Black. ANSI approved. Dimensions vary per model. 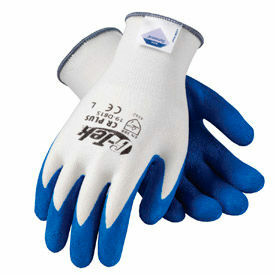 HPPE/PVC Cut Resistant Gloves Provides Exceptional Slash, Abrasion And Heat Resistance. Cut Resistant Gloves are made with high performance polyethylene shell for exceptional cut protection to hands. Synthetic rubber dipped palm provides excellent grip in oily, wet or dry environments. Gloves are ergonomically designed to minimize hand fatigue and increase comfort and dexterity. Antimicrobial coating eliminates the growth of bacteria while effectively killing odors. Available sizes are M, L and XL. Sold by the pair.